Lidya Tchakerian is an Armenian Lebanese artist currently living in the USA. Ms. Tchakerian creates paintings that are very expressive. 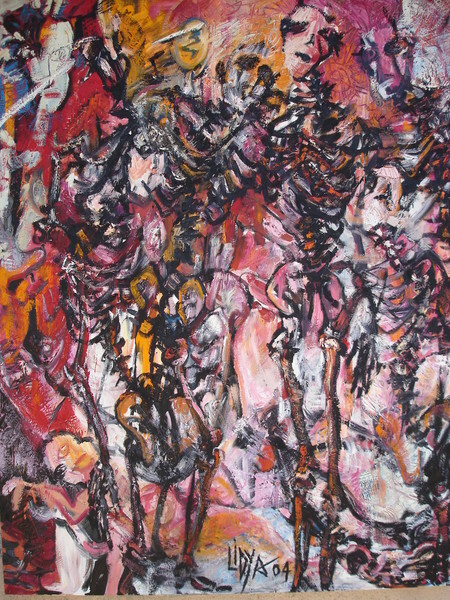 She captures the essence of our collective anxieties and fears by utilizing her skill of bold brush strokes and color. When I observe her paintings I think about how her use of paint reveals raw, uninhibited emotion. In my opinion, Ms. Tchakerian displays the concerns that are shared throughout our civilization. The past, present, and future is mixed together in a chaotic swirl of brush strokes and color. A. "I always painted and made three dimensional objects as long as I can remember and been lucky having parents, family and society that supported and encouraged me all the way. It was natural thing to be an artist. It was meant to be." A. "You are asking me who am I. I am who I am. Professionally and personally I am the same honest person with everybody, myself and my art. I feel the pain and the joy of beings, see the forms and colors around me, and feel the texture and importance of an object in the time of its existence, regardless of its useless functional existence in the society." You can see at the upper right corner of the painting a grey fish, a big X and my signature, while in the middle of the work there are three fishes that made their circle with no implication of accepting new comers to their circle." A. "I always admired, Picasso’s intelligence of working in all styles, Joan Miro’s genius of titling his works in contrast meanings, Arshile Gorky’s’ biomorphic shapes, Wassily Kandinsky’s compositions, Willem De Kooning’s large composed eyes for his figures, Piet Mondrian’s horizontal and vertical structural lines, Nicolas de Stael’s large scaled spiritual art, Marc Shagall’s nostalgia to his native homeland, Salvador Dali’s obsessed love to Gala (his wife) and his art, Van Gogh’s obsession of art, Gauguin’s escape from bourgeois life to simple life of Tahiti." A. "Being an Armenian Lebanese artist living in USA, are the main influences of my art today. As a Descendent of the Armenian genocide and inheriting the violent graphical pictures of the victims, made me feel the pain of others and the ability to express feelings of beings artistically. In USA where there are different forms of cultures, makes me open to all kind of arts understanding their influential cultural background. Living in different situations and cultures made me experimental in my art. Putting different forms and textures that sometimes attract and other times repel. It is like casting the iron into the flames of fire to shape into beautiful functional objects for others to appreciate, or like the graveyard of millions in an unknown time and place producing treasures (oil) to future cultures. Enjoying the best of beauty and culture with the bitter of pain and misery gives my works mysterious character where beauty and pain blend in harmony." A. "They are open cultural people who appreciate beauty, art and life of beings. I have done a painting on curtains for the main altar of the Cathedral of Armenian Chatholicosate of Cilicia. "The Resurrection of the Christ" commissioned by the diseased, His Holiness Karekin I Sarkissian Catholicos of All Armenians. Architects, doctors, lecturers and artists are the most appreciative of my art. Children are the collectors of tomorrow, yes children although my art is difficult to understand I always see curiosity in their open eyes when they gaze into my art." Q. Do you have an upcoming exhibit? If so, where and when? A. "I have an upcoming solo exhibition in April 2007 at Harvest Gallery Glendale www.harvestgallery.com"
Q. Where do you see your art in 10 years? What are your plans? A. "I see my art becoming more conceptual, subjective abstract minimalist art being exhibited in major museums of the world, my plan is to work hard to achieve my goals." A. ""I Was Like You, You Will Become Like Me" are sequences of painted skeletons on large scaled canvases (twins), which invite the spectators to be involved with their title and be part of their existence. These works are in homage to the victims of the coming third, forth, fifth…….. World wars if the world exists until then. The history of humanity repeats itself; there are wars, civil wars and genocides everywhere. And!!!!! For what reason!!! POWER? The paintings ask to the viewer when they try to read their name. You who have the power look at me and call my name "I Was Like You, You Will Become Like Me". Is there anyone who can break the chain of the history and stop all wars? They respond one more time to the viewer! Remember my name for the times to come "I Was Like You, You Will Become Like Me. One of these pieces (http://images.artwanted.com/large/77/29249_390277.jpg ) was showcased in the 2nd Biennial International Juried Exhibition by World Council for Arts & Culture in Herbst International Exhibition Hall, San Francisco, CA, 2005. http://worldcouncilforarts.org"
A. "The conscious and subconscious feelings of humanity and large scales of canvases moves and inspires me. I work spontaneously and constantly covering and layering the canvas with oil paint, blending art, culture and the history of humanity into new forms of existing identities. Sometimes I use the color directly from the tube exploring its pure power and energy, other times using brush, hand and other objects that scratch and mark the painting in an instant moment of time, recording its existence in the history of art and time. In the process I constantly discover new territory of expression, dimension, texture and identity. Every one of my paintings has the beauty, mystery, misery and history of its own – which is the background and instant history of its existence. The history of art and humanity that is cruel to its heritages; the history of culture, wars and civil wars which leave behind contradictions and wounds; sculpt the conflict of existence, which in its case forms a new concept of culture developing divers forms of art. Why make statements when the heartbeat, the conscious, the subconscious and existence of the artist create artwork, which is the existing reality of its creator, where they blend into one identity. Art itself is a manifesto of its existence." "I work with oil painting because of its richness in texture and its sensibility of showing spontaneous brush strokes and objects that I use for texture. I work with mixed media because of its unlimited choices of different Medias to explore and experiment for new textures and expressions." Q. Do you have a degree or do you plan to attend school for art? A. "I have Masters Degree in Fine Arts from ALBA (Academie Libanaise des Beaux-Art) Beirut, Lebanon and have been professor, lecturer in three different University, Academy, and College and I’ve been giving private lessons for more then a decade." Brad Cooper Gallery, Tampa, FL Gallery Z, Providence, Rhode Island Harvest Gallery, Glendale, CA"
Q. Are you represented by a gallery? If not, do you want to be? A. "Currently I am not represented by a Gallery, but I would like to be." Q.Why do you create art? A. "It is the choice of life or death either you live or die. I chose to live. Life is too short. Learn to love and live in peace"
Q.Where can we find you on myartspace.com? A. "In myartspace.com gallery, under the name Lidya." I hope that you have enjoyed this interview with Lidya Tchakerian. Feel free to critique her work. Be sure to check out her myartspace.com gallery by doing a search for Lidya on the site.